Everyday Sociology Reader combines classic and contemporary readings by sociologists and seeks to meet students where they are, offering observations on popular culture, family life, news events, and other aspects of everyday life. Posts from the Everyday Sociology Blog and traditional readings have been chosen for their relevance and readability; all are written in an engaging manner in order to engage students new to sociology and sociological thinking. Each section of the book features three blog posts and two traditional readings, as well as discussion questions, activities, research ideas, and essay suggestions so that students become not just active in the learning process, but creators of sociological thinking as well. Connections between sociological concepts and students’ everyday lives. 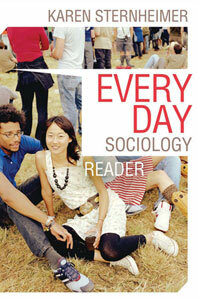 Everyday Sociology Reader has ten modules that follow the most common topics taught in introductory sociology courses. Each module includes key readings in sociology, as well as examples of sociologists applying their insights to everyday life, popular culture, and current events. Everyday Sociology Reader includes three types of review material at the end of each chapter: “Talk about it” questions designed for group discussion in class or online; “Write about it”: review questions for short answer or essay assignments; and “Do it” activities that students can do individually or in groups. Based on the popular sociology blog. The Everyday Sociology Blog has attracted over half a million visitors since its launch in 2007. Everyday Sociology Reader makes it even easier for instructors to incorporate essays from the blog into the classroom by collecting some of the most “teachable” posts and pairing them with essential sociological essays and useful activities and assignments. Updated regularly and now featuring video interviews with well-known sociologists, the Everyday Sociology Blog is a dynamic blog that encourages student and professional sociologists to explore sociology’s relevance to popular culture, mass media, and everyday life. Moderated by Karen Sternheimer (University of Southern California), the blog features postings on topical subjects, video interviews with well-known sociologists, and contributions from special guests during the academic year. For only $10 net, Everyday Sociology Reader can be packaged with any of our introductory sociology titles. With its focus on student participation, everyday life, and popular culture, it’s an ideal supplement to any introductory textbook. Sexual Orientation: SALLY RASKOFF, Does Finger Size Reveal Sexual Orientation? Child Care: JANICE PRINCE INNISS, Who Cares for America’s Babies? Religion and Deviance: KATHLEEN LOWNEY, What Is a Cult? Generational Change: DUANE F ALWIN, Generations X, Y and Z: Are They Changing America?